Mariatu's Hope offers three different strategies when adding new water points. We have access to a Deep Rock 100 drilling rig. We use this rig in harder formations and when the need is to drill deeper than 120ft. This method is fast but requires more resources due to higher fuel consumption and the need for a specialized trained drilling team. It is a handy rig and drills a fine bore hole. This approach is still under development. 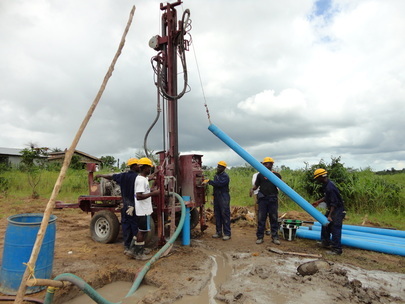 We are in the process of raising money to purchase the Drill Rig (pictured right). This is a handy rig capable of drill up 200ft. in soft formations. It is portable and efficient. and Government. We will conduct a one week training both in drill rig operation and safety. We will identify a community in need by our normal community engagement activities. 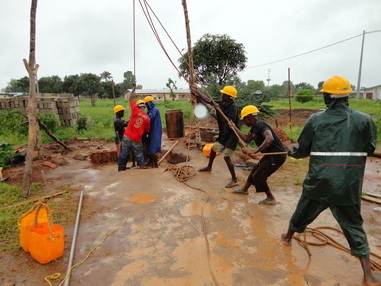 We will use the trained missionary team to drill the well. 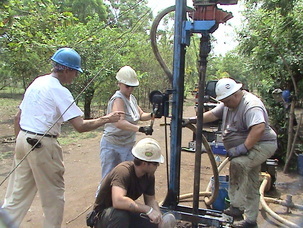 This is a life changing experience, In fact we the founders of Mariatu's Hope went on a Mission Trip in 2007 to Nicaragua and drilled a well using a LS 200. "Our lives were transformed", at that point we became fulltime missionaries. This method is a combination of hand auguring and percussion drilling. This takes the most time but it is the most rewarding to undertake. It is done using 100% community participation. It does require strong community man power. This method is capable of drilling up to 100ft in soft formation.